The first test in the world allowing the screening of the majority of new synthetic drugs. This test reveals any consumption of new molecules derived from cathinone and synthetic cannabinoids. Made in France and certified ISO 9001 / ISO 13485. 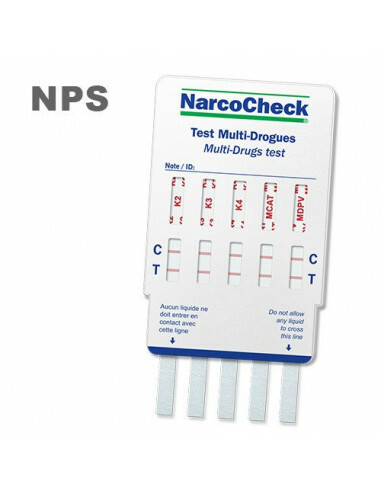 The first test specifically made for New Psychoactive Substances (NPS) ! They are called new synthetic drugs, bath salts, or RC (Research Chemicals). They the new drugs and psychoactive substances that are currently spreading all over the world. Their consumption has been growing steadily since 2008-2010. Every year, dozens of new molecules are identified on the black market of drugs. Young people try these new drugs without even knowing about their real toxicity and long-term effects on health. If there are so many new synthetic drugs, it is to succeed in counteracting international drug laws. When one of these molecules becomes illegal, it is slightly modified so that it becomes technically legal again (or more precisely, non-illegal) and allows the continuation of the parallel and very lucrative market of new drugs. There are half a dozen classes of new psychoactive substances. Two of them are particularly distinguished and represent a large majority of these molecules: cathinone derivatives and synthetic cannabinoids. 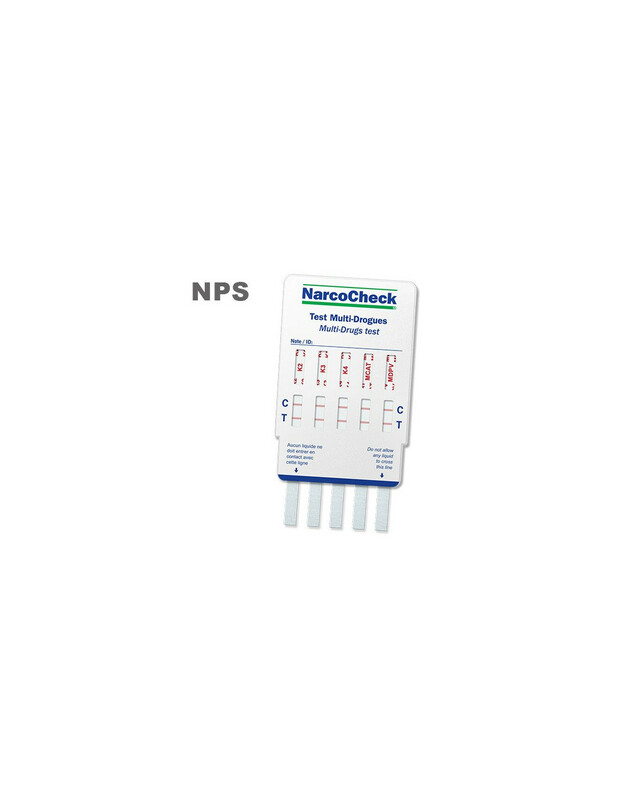 The NarcoCheck® multi-NPS test is the first of its kind, as it allows the detection of the consumption of the main classes of new synthetic products. K2 / Spice : Synthetic cannabinoids. Synthetic cannabis is not natural. These products mimic cannabis in its appearance because they are visibly made up of plants and herbs, but these plants are in fact totally impregnated with powerful psychoactive chemicals. K2 is also called Spice, and it has been the first generation of synthetic cannabinoids to appear in the mid-2000. The use of this class of drugs is now detectable thanks to this test. K3 / AB-Pinaca : Synthetic cannabinoids. Second generation on synthetic cannabis to appear in 2014-2015, K3 is also called AB-Pinaca, and it is as dangerous as the first one. The use of this drug is currently growing fast, and it already has caused the death of several people. K4 / UR-144 : Synthetic cannabinoids. UR-144 is a third type of synthetic cannabinoids, also increasingly present in synthetic cannabis samples since 2013-2015. MethCathinones are a class of molecules derived from cathinone, the main active substance in Khat (or Chat), a sub-Saharan plant cultivated and consumed for its strong psychotropic effects close to amphetamines and ecstasy. Methcathinone, therefore, is the fully chemical (and overpowering) version of this natural cathinone. There are dozens of methcathinone sub-molecules (mephedrone, 3-MMC, 4-MEC, butylone, methylone etc. ), and this test makes it possible to demonstrate the consumption thereof. This substance is another type of synthetic cathinone, whose effects are also extremely powerful. Like most cathinone derivatives, it has been popularized and sold under innocuous names as "bath salts" or "fertilizers". This test can be used in addition to our 5in1 multi-drug test, so as to cover a much wider spectrum of potentially consumed products. This test is not cross-reactive with more "conventional" synthetic drugs, such as amphetamines, methamphetamine, MDMA etc., which ensures that any positive result will reveal consumption of new synthetic products.